DISCLOSURE: This post is sponsored by Chick-fil-A and The Motherhood. All opinions are my own. Heroes are applauded every day for the work they do. It's important to acknowledge when a person goes above and beyond, but there's one hero who is often overlooked. She works silently and diligently behind the scenes. She always puts the needs of others above her own. And she rarely gets praise for the endless work she does. We all know who she is...Mom! Motherhood is a journey like no other. It's beautiful, scary, stressful and incredible all at the same time. Being a mom is the hardest, yet most rewarding job you will ever have! Moms are the unsung heroes. They simply don't get praised often enough for one of the most important jobs there is: raising good human beings. Being a mother is especially challenging these days. 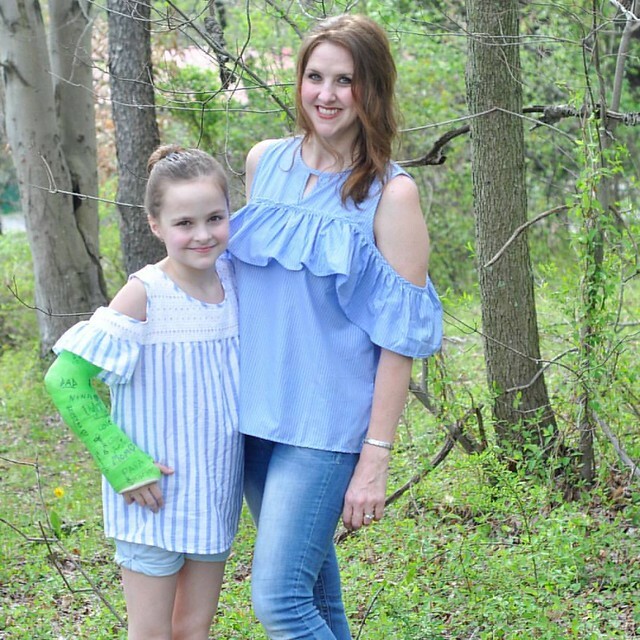 With the strong presence of "perfect" moms who are doing it all on social media, it's so easy to feel less than ideal. It's easy to feel like you just aren't doing enough and you're not good enough. But that's simply not true. The majority of moms are great moms. They are just trying their hardest to raise decent kids and make it through the long days. They give their all and expect nothing in return, because they would do ANYTHING for their child. The real truth is, every mom possesses a gift that is unique to them and them only. Whether it be a beautiful singing voice that lulls their child to sleep or arms that hug like no other or an animated voice that captivates their child during story time, every mom is unique. It doesn't matter how we compare to other moms. The only thing that matters is what kind of mom we are to our own kids. I'd be willing to bet that the majority of our kids would tell us that we are more than good enough. We need to ignore social media presence, EMBRACE the unique traits that we have, and just focus on loving our kids! They think we are heroes, and I do, too! To the single mom...YOU are a hero. To the mom who goes to work for her family...YOU are a hero. To the stay at home mom...YOU are a hero. To the mom who works at home amidst the chaos...YOU are a hero. To the military moms who are solo parenting for months on end...YOU are a hero. To the mom who breastfeeds...YOU are a hero. To the mom who formula feeds...YOU are a hero. 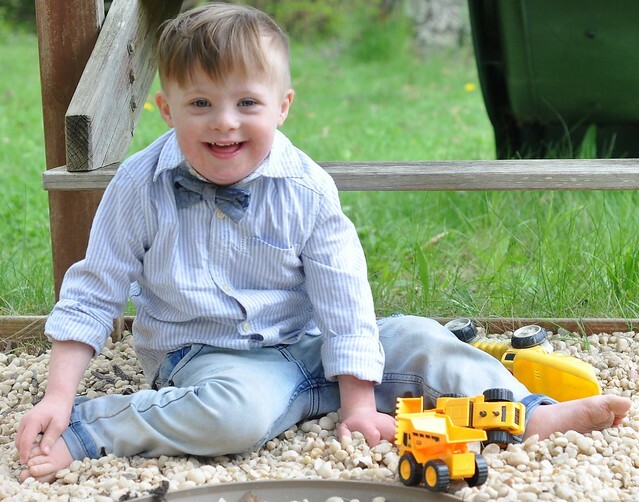 To the mom who has a child with special needs...YOU are a hero. To the mom who has one child...YOU are a hero. To the mom who has 10 kids...YOU are a hero. To the mom who has multiples...YOU are a hero. To the mom who birthed their own child...YOU are a hero. 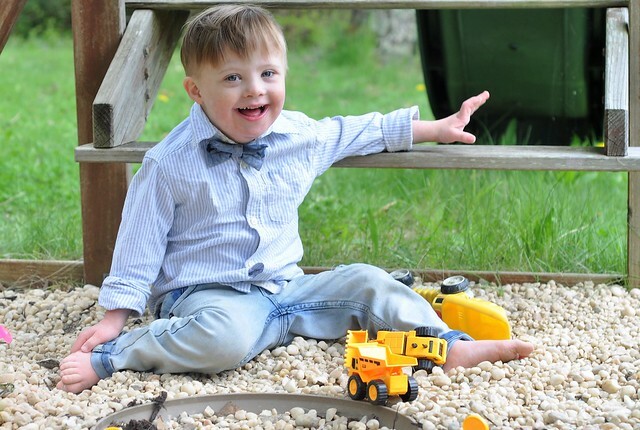 To the mom who adopted a child...YOU are a hero. 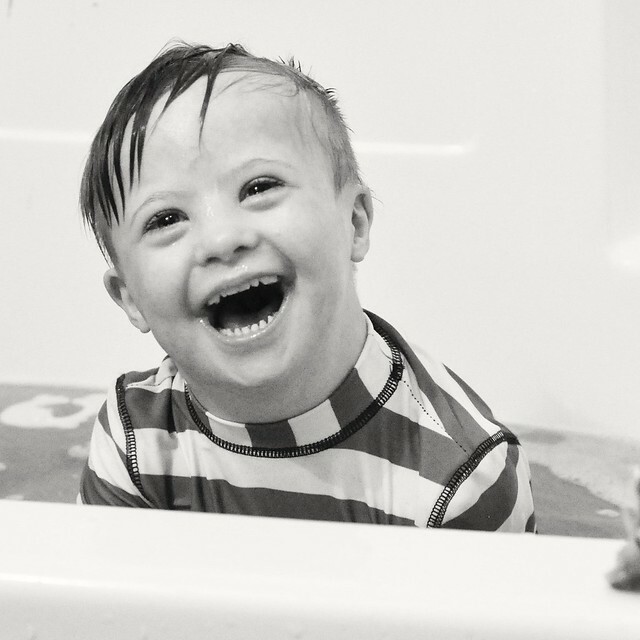 To the mom who gave her child up for adoption...YOU are a hero. 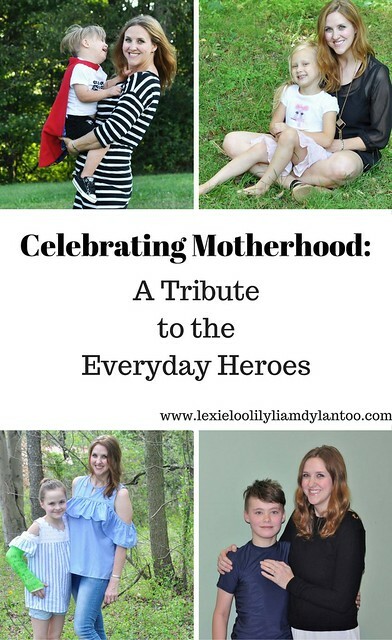 To the woman who is struggling to become a mom...YOU are a hero. To the young mom...YOU are a hero. To the older mom...YOU are a hero. 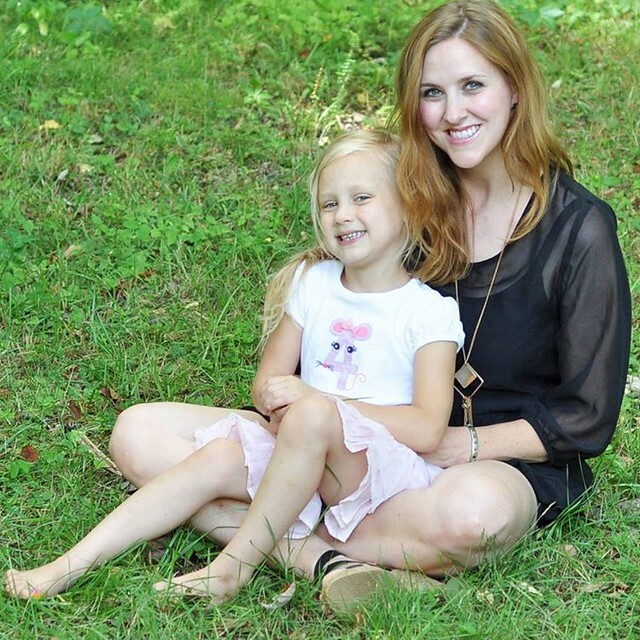 To the mom who homeschools...YOU are a hero. To the mom who sends her child to school...YOU are a hero. 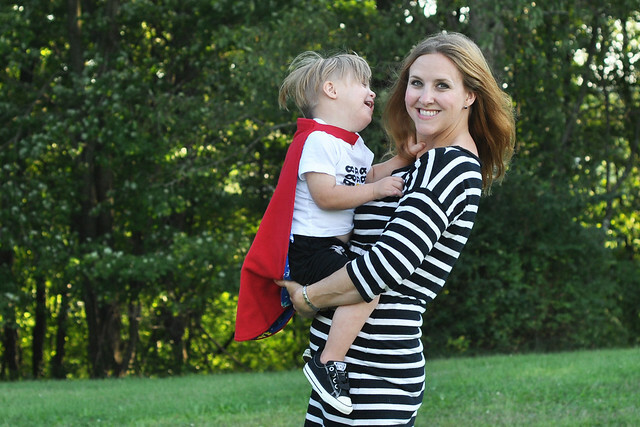 To the mom who juggles activities...YOU are a hero. 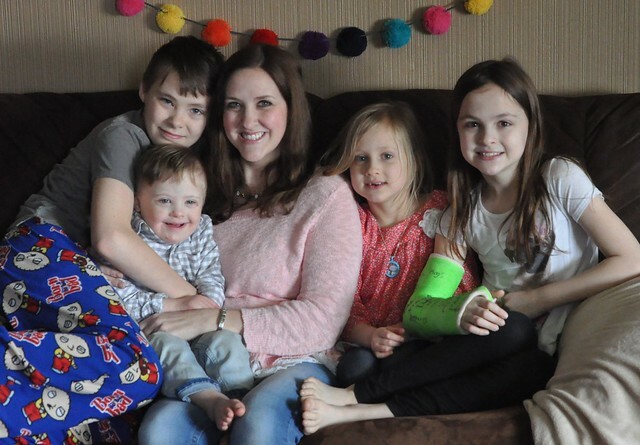 To the mom who focuses on family life at home...YOU are a hero. To every mom, everywhere, who is trying her hardest and loving her kids...YOU are a hero. You are enough. You matter. And you are making a difference! I decided to ask my adorable crew a few questions to see which hero qualities they thought I possessed! Mom: "Why am I a hero?" Dylan: "Because you do stuff for me and you are always by my side if I'm hurt or if I'm sad." Mom: "What did I do today that was special?" Dylan: "You played football with me even though I hurt your finger with the ball yesterday. Most moms wouldn't do that. I thought it was really cool of you." 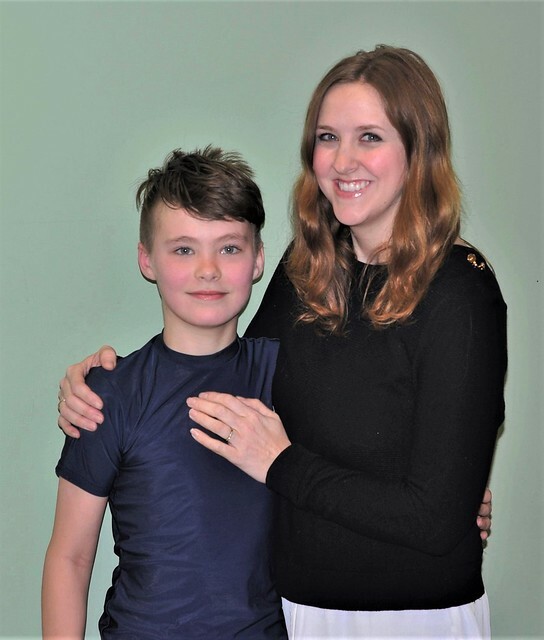 Mom Thoughts: Even though he's a tween, he's still such a sweet kid! And yes, he did heave a football at my fingers and injured them, but that's just part of the game! Mom: "Why do you think I'm a hero?" Lexie: "Because you take care of me when I'm sick, you help me with my homework, and you love me, cook for me and care for me!" Lexie: "Well, I can't do anything because of my cast...so you helped me get dressed and you put my hair in a bun. You also left me a sweet note in my lunchbox, which made me feel special and loved." Mom Thoughts: Lexie is always mature beyond her years and knows exactly what's important in life! Mom: "What makes me a hero?" Lily: "You always be nice and you always help me unzipper my jacket! You also make me food really quick, and I like that because I'm always starving. And when you had your horse, you always let me go on it and ride it. His name is Cherokee. But he died. You're also a hero because you record me sometimes and it makes me feel like I'm on YouTube. Wait...are you recording this?!?" Lily: "You took me to the park, you let me push the little cart at the grocery store and get candy, you helped me learn things, you pushed me on the swing, you jumped on the trampoline with me and it was so funny and so fun, you watched a YouTube video to learn how to do an Elsa braided bun and YOU DID IT, and you came to my Open House and were proud of my hard work! Oh and you watched me dance at dance class and looked proud!" Mom Thoughts: Lily has a BIG personality. She has a lot to say and she's going to go places in this world! Mom: "What makes mama a hero?" Liam: "Hi, Mama! Hi! Nigh-Nigh. Love you. Bye! Bye! Bye, mama." Liam: "Hi, Mama! Love you. Too-da-loo!" Mom: "Is it time for bed?" 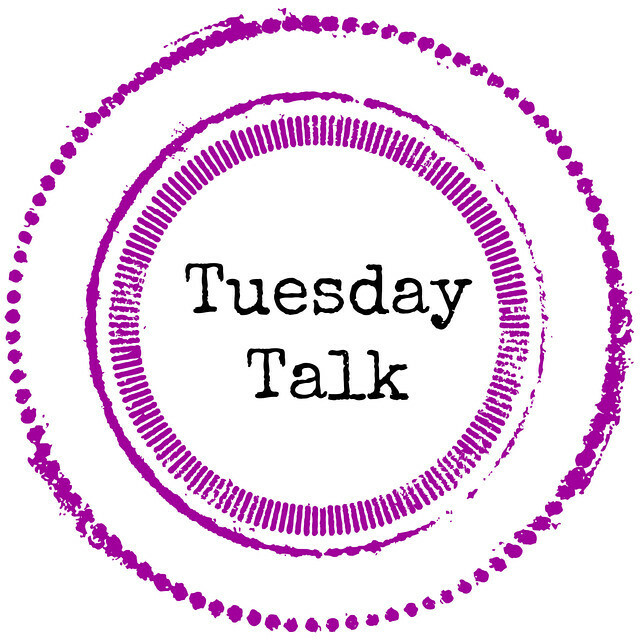 Mom Thoughts: If he could put it into words, I think his favorite things would be me taking him to the park and me pushing him on the swing, even though it was raining! 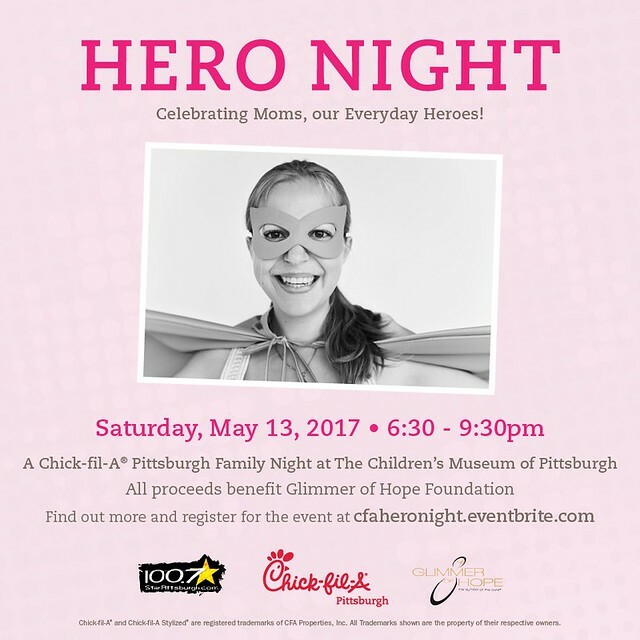 If you're a mom in the Pittsburgh area, Chick-fil-A Pittsburgh invites you to attend Hero Night at The Children's Museum of Pittsburgh on May 13th, from 6:30-9:30 PM. 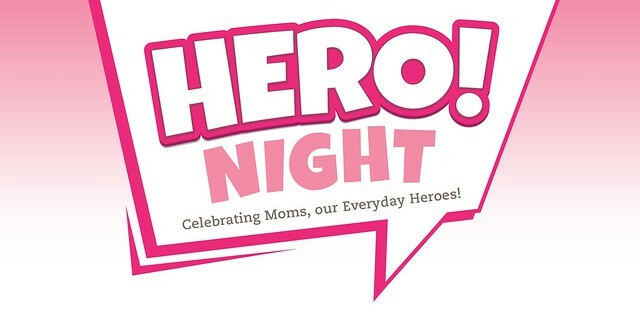 This fun family night will focus on celebrating moms, our everyday heroes! The best part is that you can give back while having a great time! All ticket proceeds will benefit A Glimmer of Hope Foundation, which is a Pittsburgh-based breast cancer foundation. Glimmer of Hope was founded in 1994 by Diana Napper, to honor the wishes of her best friend, who lost the fight against the disease. After losing my own grandmother to breast cancer years before she should have left us, this is a cause I can proudly support! The $10/person ticket cost includes museum admission, food and fun family activities. Your family can walk the red carpet fit for everyday heroes, enjoy delicious Chick-fil-A food and snacks, contribute to the "Thank You Mom Tree" and dance on the dance floor! There will also be photos, face painting, balloon art, hair braiding and chalk design. There will also be opportunities to give back to A Glimmer of Hope Foundation. In the art studio, your kids can design action hero capes, you can decorate action hero masks or purchase a customized mini plush Chick-fil-A cow! Come join Chick-fil-A Pittsburgh on May 13th for this fun family night, and make a difference! Chick-fil-A Hero Night tickets can be purchased HERE. My family will be proudly supporting this cause and we hope we will see you there! If you see us, come over to say hi. You can't miss my crew. I'll be the one chasing after the toddler tornado! DISCLOSURE: This post is sponsored by Nuby. 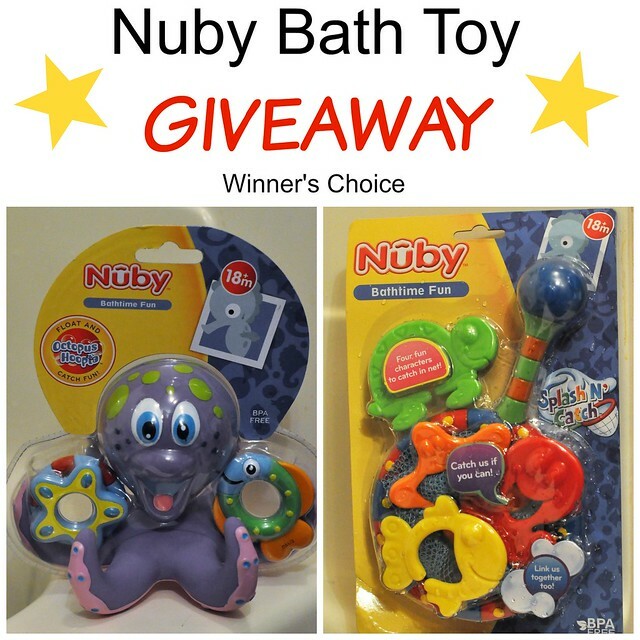 As a Nuby Parent Blogger, I received these products in exchange for my 100% honest review. During the month of April, the Rainy Day Blues tend to kick in over here, thanks to the frequent rain. All the rainy days are hard to deal with, but it's especially difficult for Liam and Lily, who just want to spend their time outdoors. If you have kids, then you know that cabin fever is legit!!! 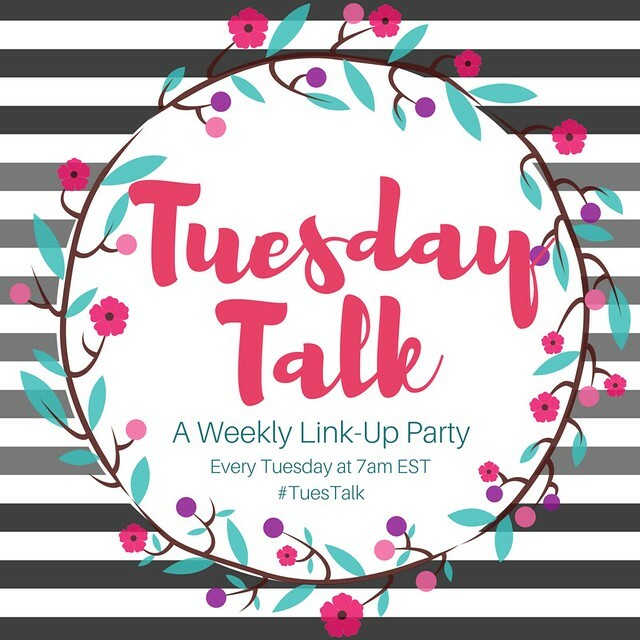 I'm always trying to come up with new crafts and activities to keep my kids busy, but sometimes I just don't want to set up another rainy day activity. 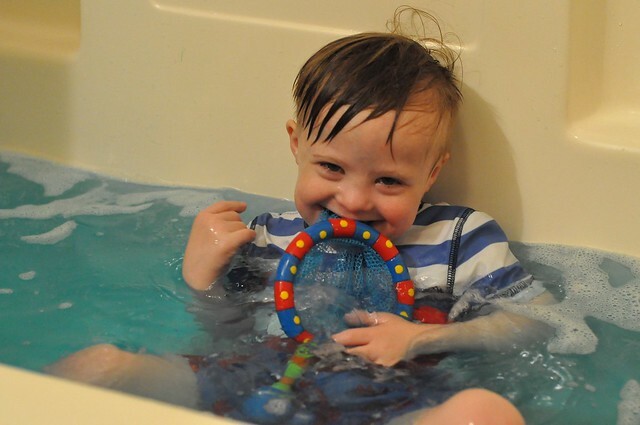 Like many moms, I often overlook the simplest way to keep them entertained, and it's something that everybody has in their home: The bathtub! 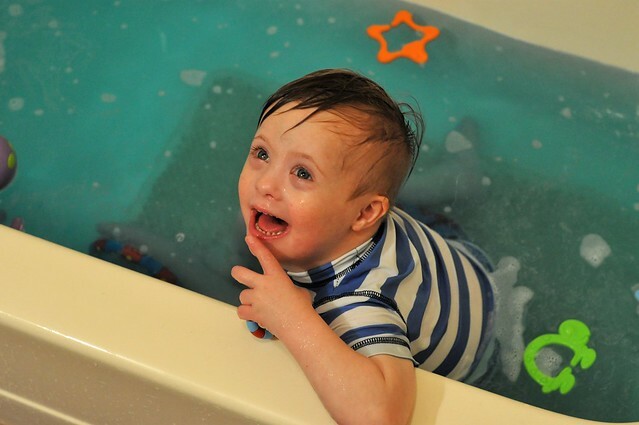 Putting on a swimsuit and taking a bath in the middle of the day can make this ordinary everyday task seem so different and so much more fun! 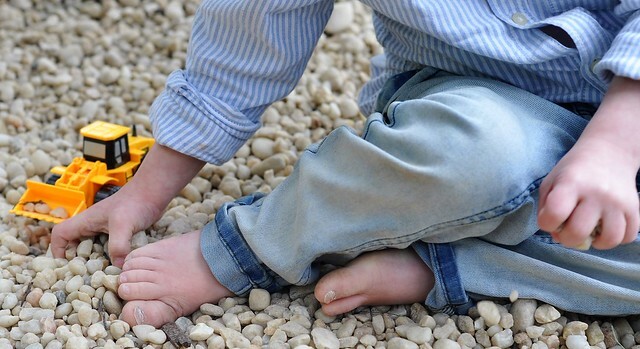 Toss in a few fun toys, grab a book (or a device to watch Netflix), and sit back and relax while your child plays. 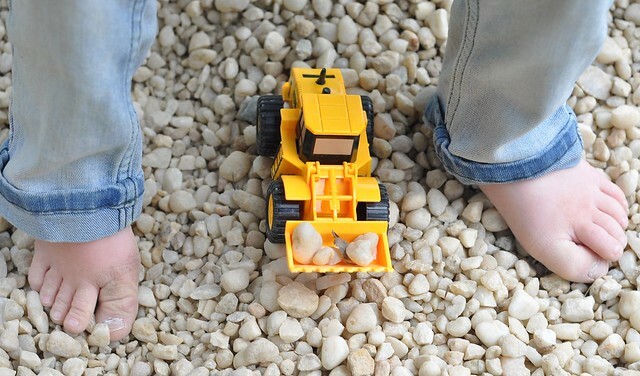 If your kids are anything like mine, this activity will give you a full hour of relaxation! An hour of not hearing, "I'm bored!" over and over again is an amazing thing! There's just something about wearing a swimsuit that makes this ordinary task seem more fun. It doesn't compare to a day at the pool, but it's still really exciting! 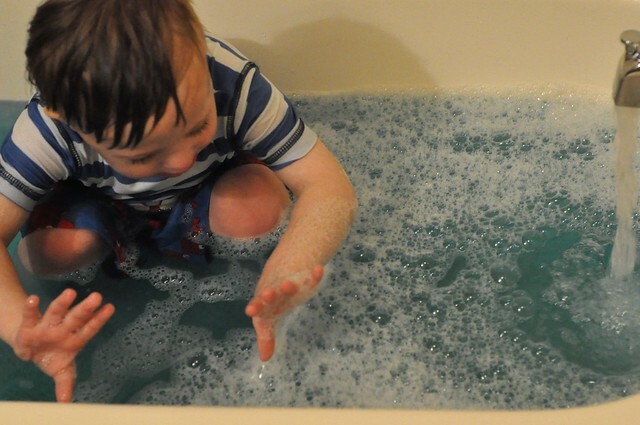 Changing the color of the bath water is so much fun! 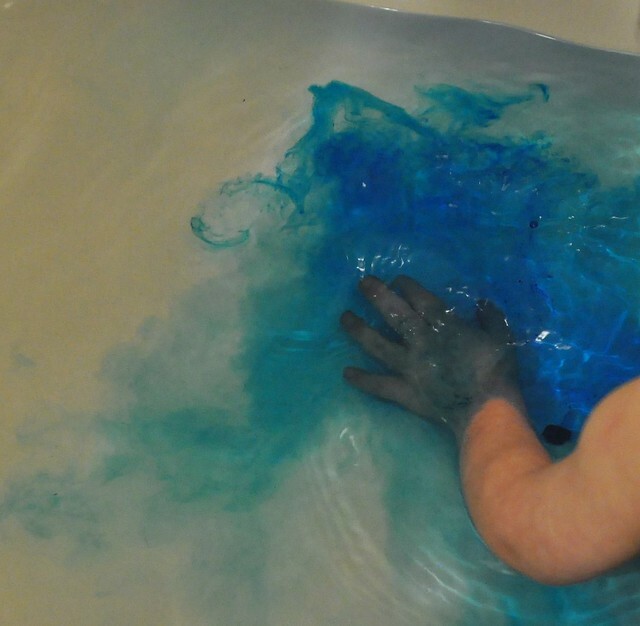 Add one color changing tablet to the bath water, or mix two for a simple lesson in color mixing! 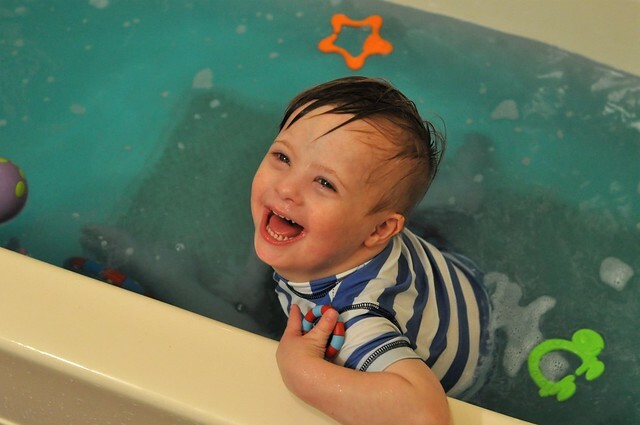 Bubble bath always makes bathtime more fun! 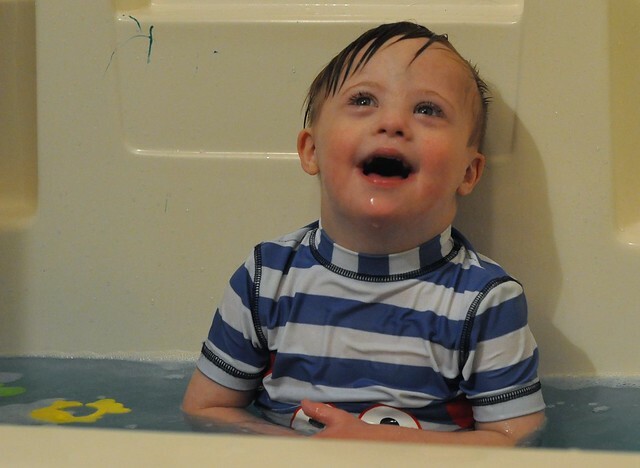 Bonus points for blowing bubbles in the tub, too! 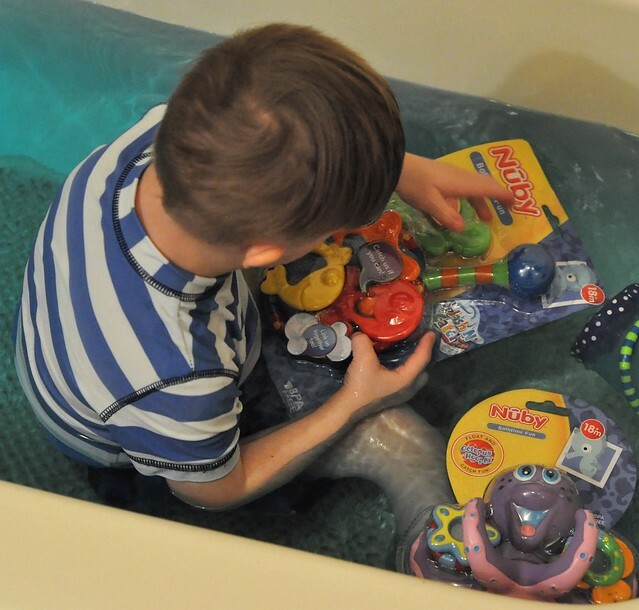 Toss in fun bath toys! Liam has two new favorites! 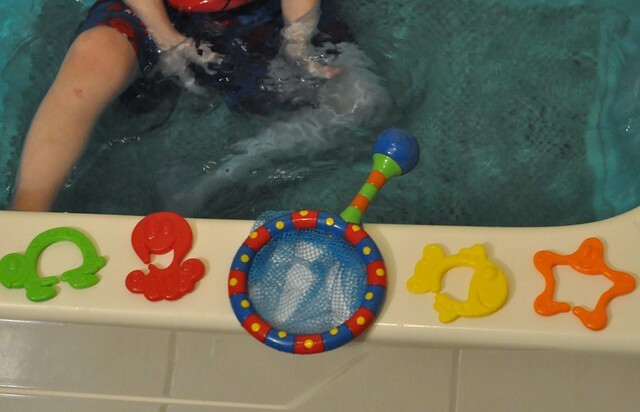 The Nuby Splash 'N Catch Bathtime Fishing Set is a versatile, BPA Free bath toy. The four colorful characters can be linked together, or the net can be used to scoop up the sea characters. 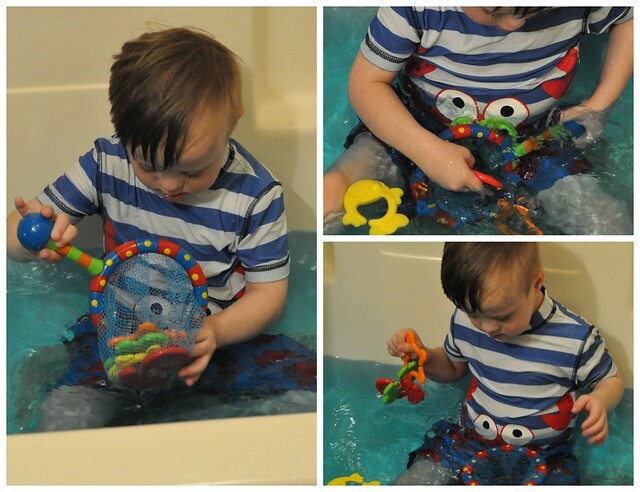 Liam loves this toy, and I love how it helps Liam strengthen his fine motor skills by scooping and linking! 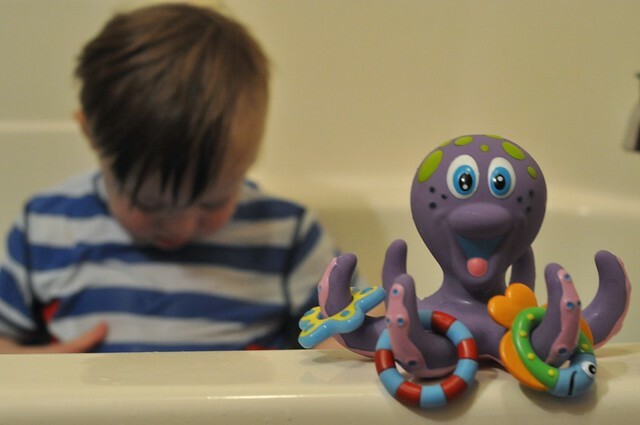 The Nuby Octopus Hoopla is such a fun toy! It's a toy and a game in one. The adorable octopus floats in the water, and the three included floating rings can be tossed onto the arms. 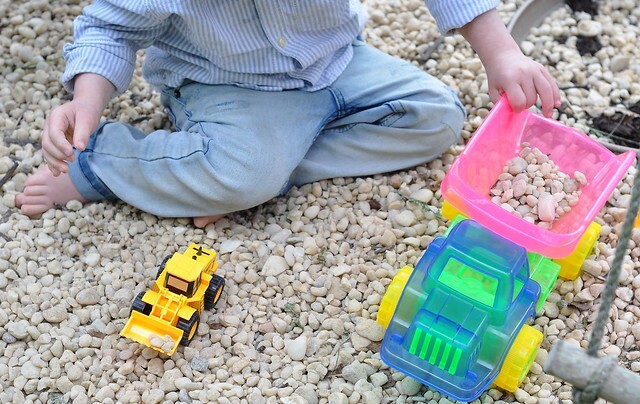 This toy is also BPA Free and is perfect for developing fine motor skills and hand-eye coordination! 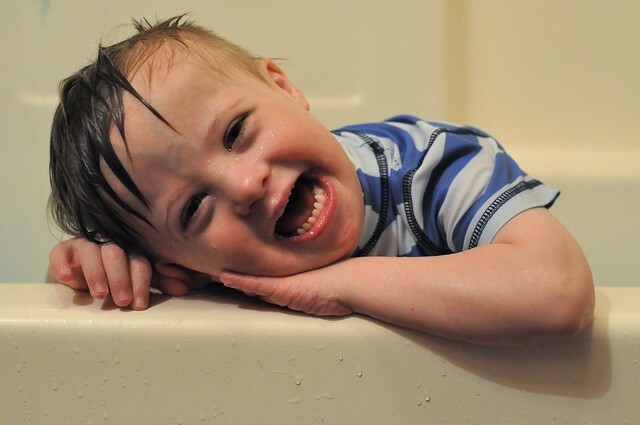 It gets this special needs mama's vote of approval! 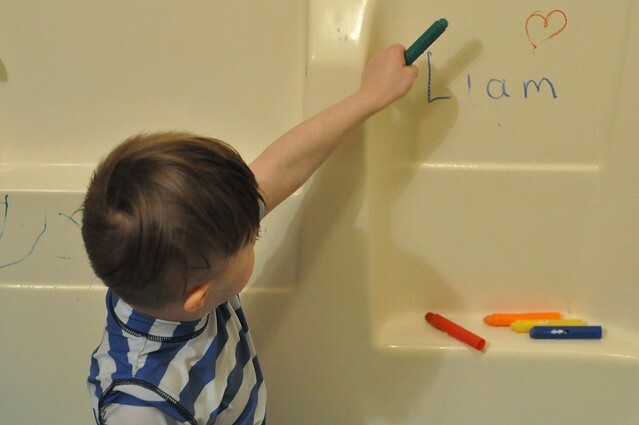 Give them washable paint and a paintbrush! 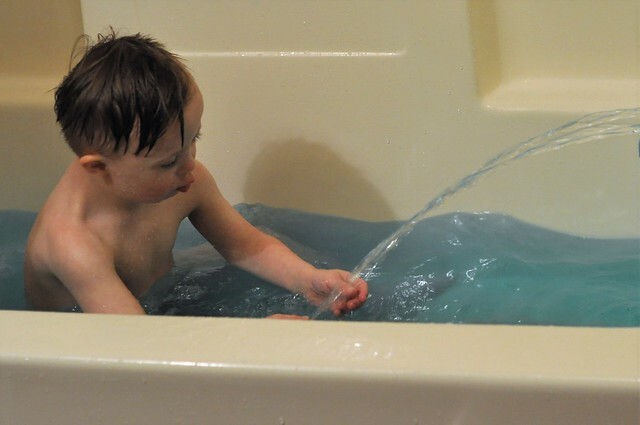 This is a favorite bathtime activity in our home! An inexpensive palette of washable paint and a paintbrush captures their attention. Even better? It wipes clean in seconds! 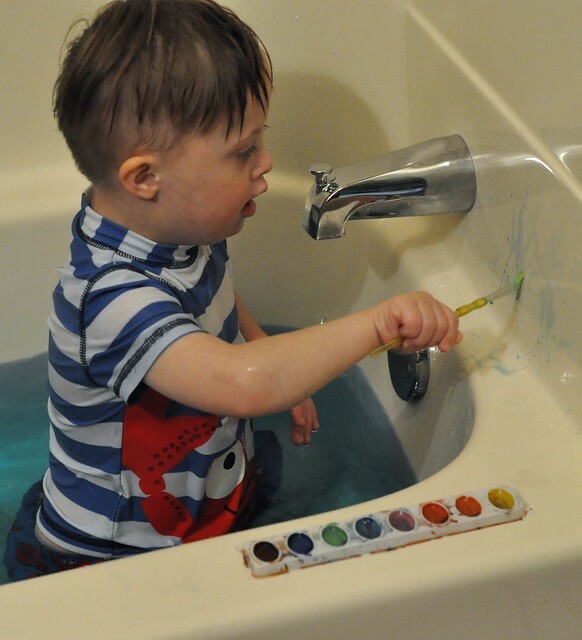 Let them color with bath crayons! 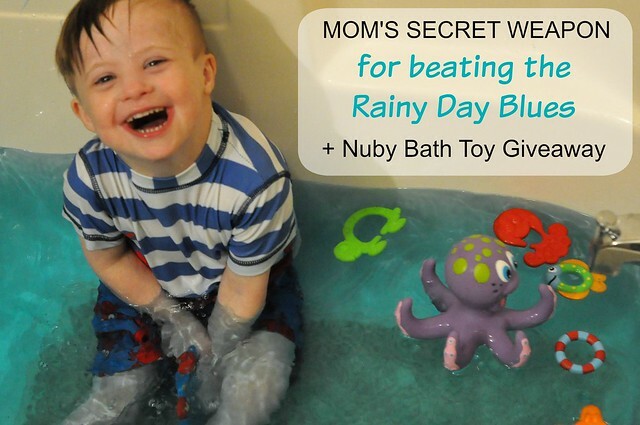 The next time the rainy day blues hit your family, send your kids to the tub! 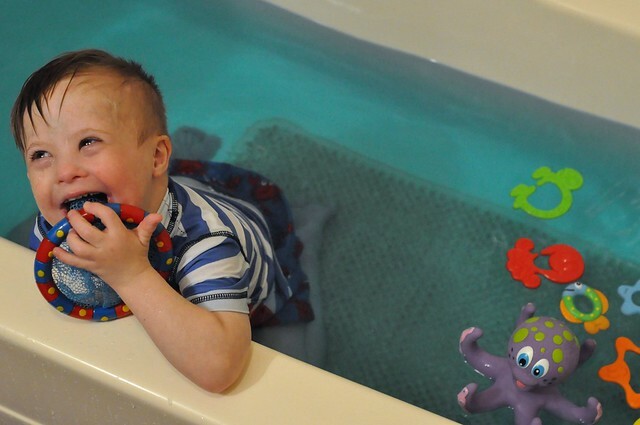 An hour of splashing may be exactly what you all need to turn the day around. After all, happy kids = happy mama! * Leave a comment telling me which toy you would choose if you won. *Visit me on Instagram and follow the directions on the GIVEAWAY that will post tomorrow morning. Over the past two years, I've been working hard to turn our backyard into an inviting space for my kids. Of course, I have dozens of projects on my to do list and not enough time to complete even a fraction of them! 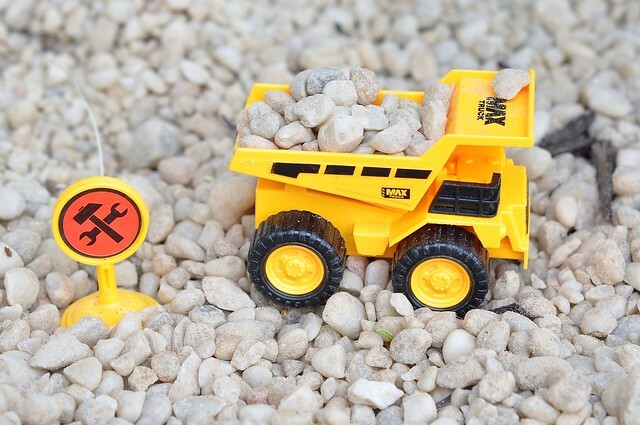 I did, however, manage to create a fun construction pit for my kids in 10 short minutes, for less than $20. The end result was an instant hit! 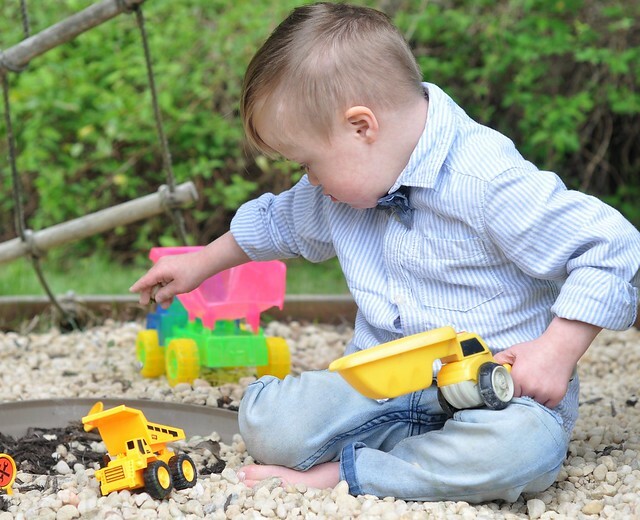 This DIY backyard project is very easy to do and inexpensive! It definitely helped that we already had a space for it, but creating the border can be very simple. Creating our construction pit only took a few minutes of time, and the kids loved it so much, that it made me regret not doing it sooner! 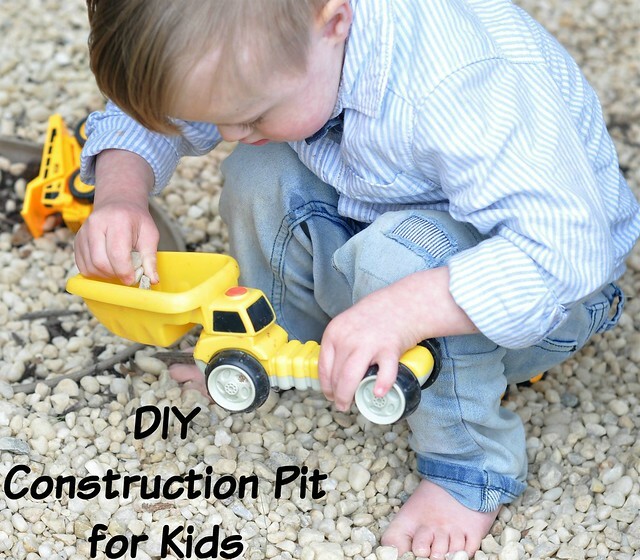 This DIY Construction Pit can be completed in just a few simple steps! 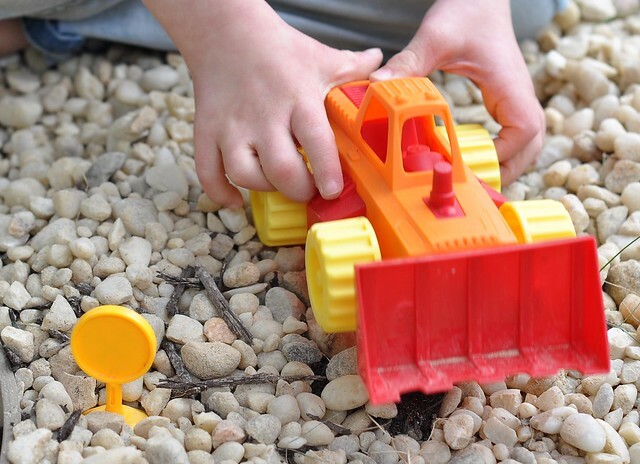 The finished project is like a large sandbox with a fun twist! 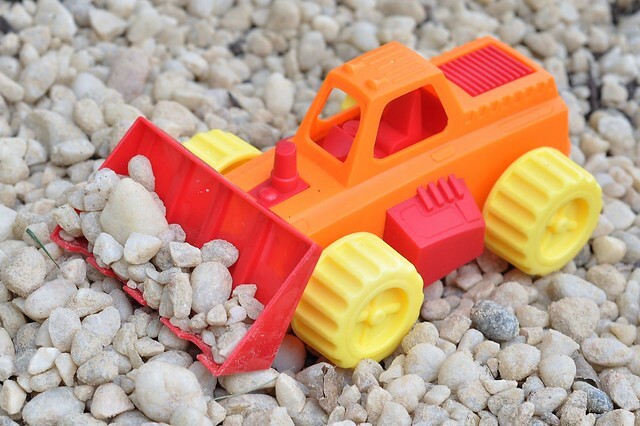 The first thing you need to do is find a spot for your construction pit and create the border. 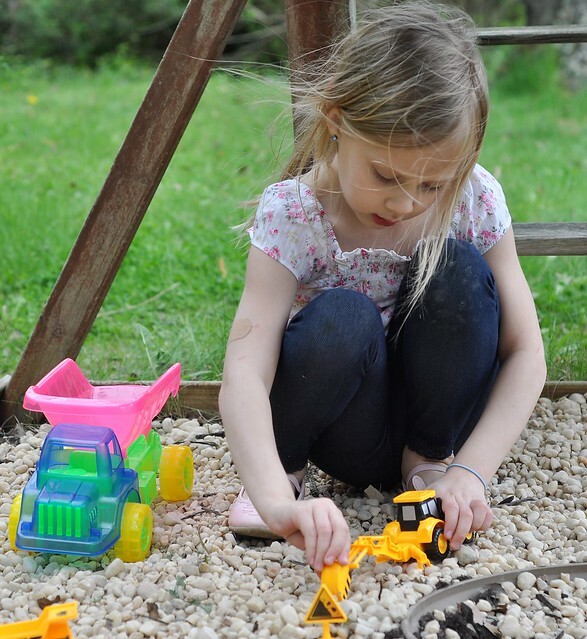 I decided to use the built in sandbox space at the bottom of our wooden swingset. It was filled with mulch and held our plastic sandbox, but since it was already framed, I moved out the sandbox and got to work! Once you find the spot, making the border is easy. Although you could build a frame by measuring and nailing pieces of wood together, it's even easier to use logs, large rocks or bricks. That also gives it a more natural feel! After the border is built, all you need to do is fill it! 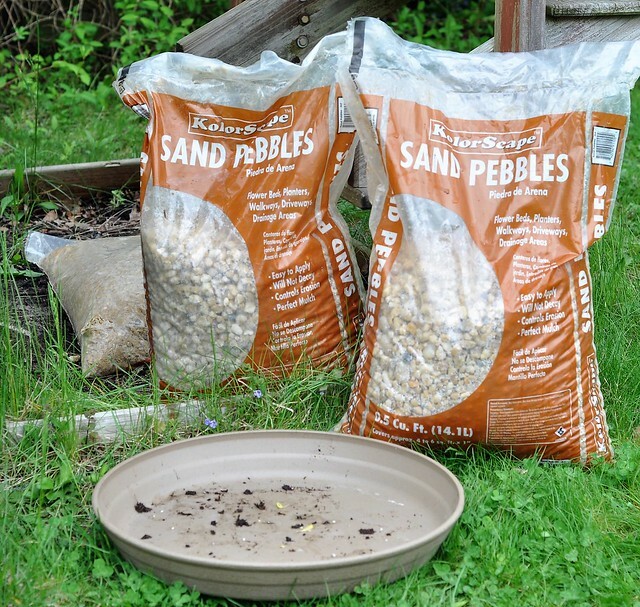 I opted to use sand pebbles because they were large and smooth. I used 5 bags for the 16 square feet space, and at just $3 a bag, it was a steal! 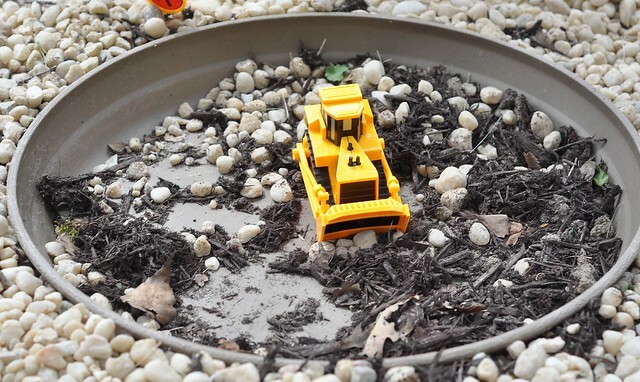 Place the shallow planter in the middle of the construction pit. 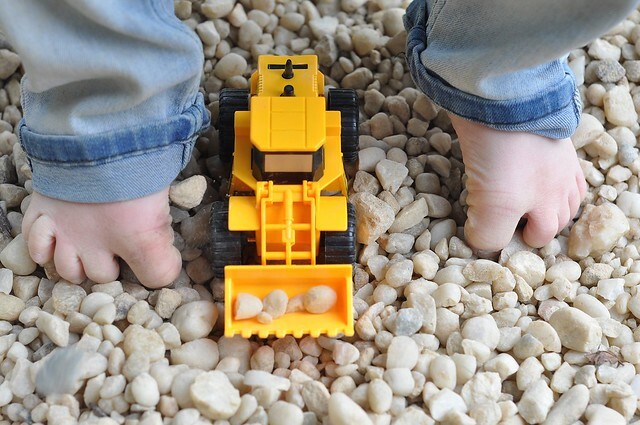 Empty the bags of rocks into the construction pit and use a rake to spread them evenly. 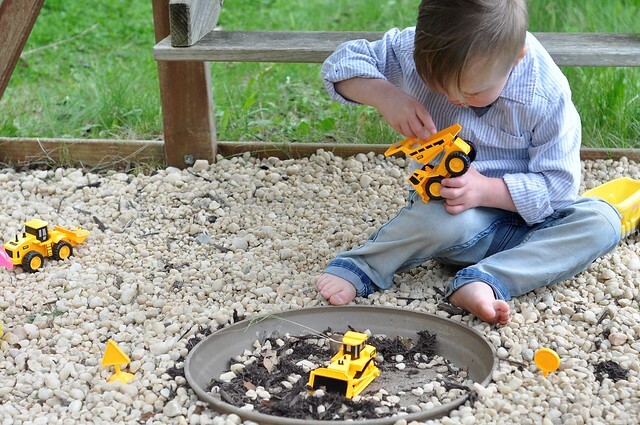 Make sure the rocks are level with the top of the planter. 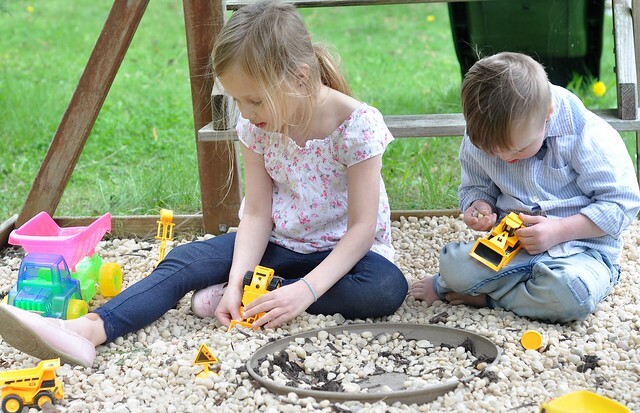 Liam and Lily immediately fell in love with this incredibly easy to make Construction Pit! Even my too-cool tweens were spotted doing some digging. 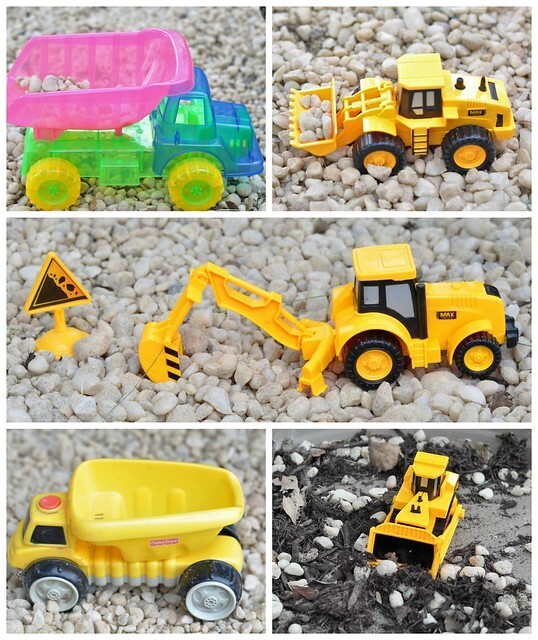 And just FYI, this construction pit is not just for boys! 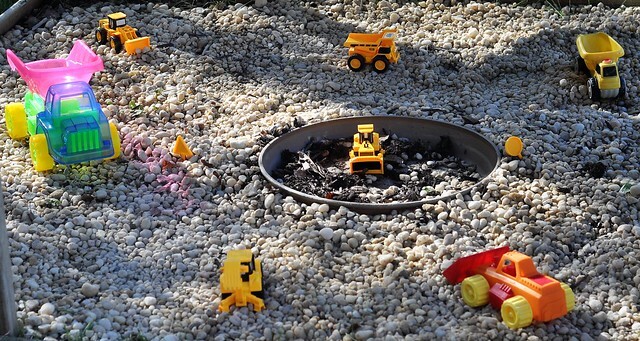 I made the construction pit on Sunday and my kids have already logged in hours playing in it. 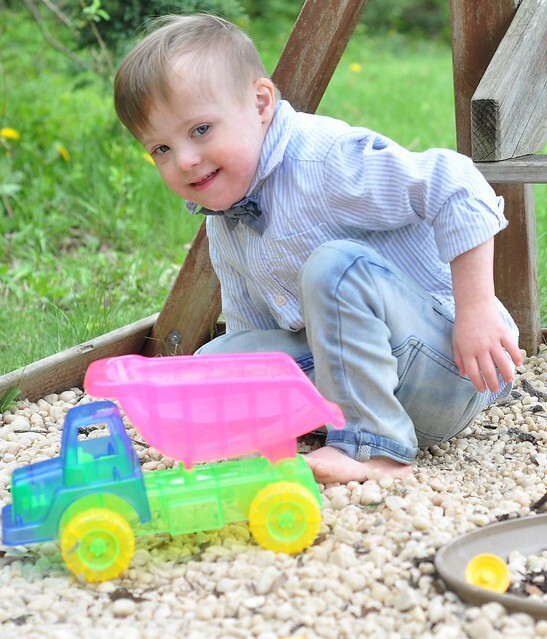 My always barefoot, truck-loving, mess-making boy is in his glory, and Lily loves digging with the construction vehicles! 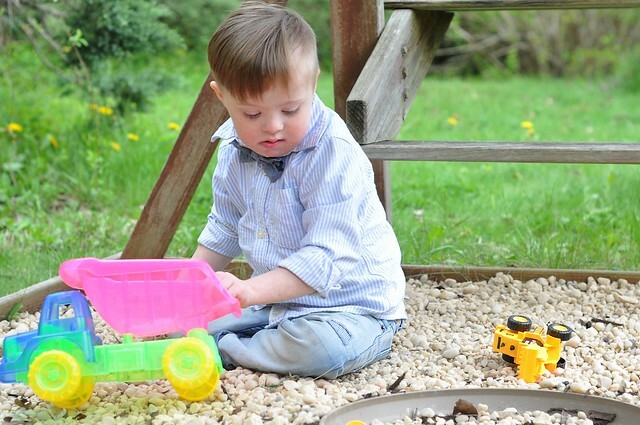 It's truly one of the easiest, most fun play spaces I've added to our backyard! Who wants to come over to play?